So, when I was working on my newest outdoor cookbook, I knew I had to include a few recipes for things served up on a stick – aka – kabobs. One of the recipes I’ve gotten the most feedback on is the chicken kabobs, using one of my “cheater” sauces grilled on an infrared grill. The recipe includes a simple basting and serving sauce made from reduced apricot preserves. Sound delicious? Read on! One of the easiest meats to grill is chicken. But, for some reason many people fear grilling chicken! The fear factor comes into play when grilling Chicken Breast! The white meat, such as breast meat, is leaner and can dry out if over cooked. Who wants to serve their family and guest a dried-out piece of meat? Or Chicken that’s cooked on the outside, but the inside of the breast is RAW! Nobody! Here’s a simple fix, find a good infrared grill and pick up an instant read meat thermometer. Having flexibility in temperatures with your grill is key. 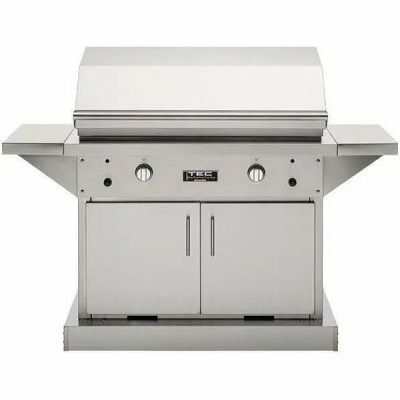 The TEC Sterling Patio 44″ Freestanding Grill is an infrared grill that breaks the mold! 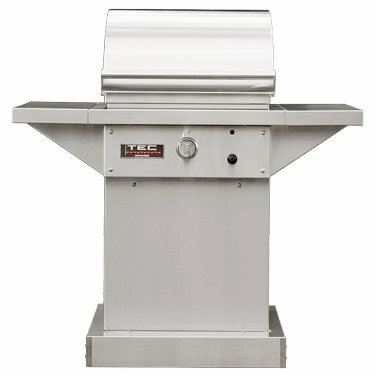 It allows for temperatures as low as 200, for low and slow, or up to 900 degrees to get those beautiful steak sear marks. Older infrared grills were misunderstood by many consumers and got a bad rap. This is because infrared grills intensify the way the heat moves from the heat source to the food. Grills with burners have the heat diffused a bit. Consumers were not used to this method of grilling, but steak houses have been using it to serve up juicy steaks for a long time. 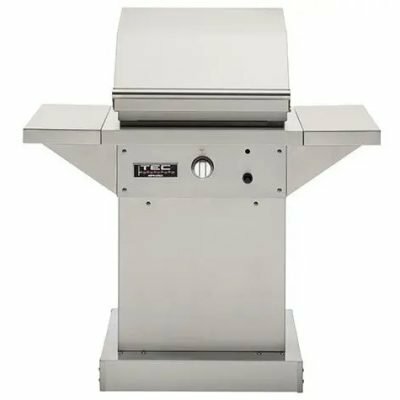 Now, infrared grills such as the TEC Sterling Patio 44″ Freestanding Grill, eliminates worry as temperature control is better than ever before! No hot or cold spots, just evenly distributed heat. Perfect for grilling anything you can imagine! One of the tips that I offer up during chef demos and book events is using something that you may already have in your fridge or pantry as the start for an easy sauce. Yes, you can start from scratch and include as many ingredients as you want in developing your signature sauce. But, if you’re in a pinch and short on time, why not make things easy? I call these “Cheater” sauces! I love apricots. The Apricot tree has roots from Armenia to China, Japan, Turkey, the entire Middle East, and more. Alexander the Great is credited with bringing apricots to Greece. Talk about an ingredient that’s traveled the world. Grab some apricot preserves, or apricot jelly, place it in a sauce pan over low heat and add a spoonful of water. The amount of water depends on how much of the preserves you use. Use enough water that it thins out. Now, the sky is the limit. You can use this as a simple basting sauce as it is or start adding things to it. Love sweet and spicy throw in a little hot mustard. You prefer savory add a little allspice. Apricot Preserve Chicken on a Stick! These kabobs are sweet, tangy, sticky, and packed with flavor. I would suggest making up a second batch of the marinade for extra basting or simply for a dipping sauce. And yes, this recipe works fine as a starting point for wings, breasts, thighs and even tasty pork chops! In a sauce pan, combine the water, bouillon cubes, preserves soy sauce, and vegetable oil. Heat over medium until preserves thin. Add in garlic, onion powder, ginger and hot sauce. Stir to mix well and remove from heat. Allow to cool for a few minutes and then transfer the mix to a bowl or zip close large bag. Add the chicken (You can use breast strips, breast cut into large cubes or even dark meat such as boneless and skinless thighs), cover or seal, and chill for at least an hour, a couple of hours, or even overnight if possible. Turn occasionally to evenly mix.